Our loving husband, father, grandfather, brother, and friend passed away in the afternoon hours of Saturday, January 26, 2019 at the McLaren Bay Region Hospital in Bay City, Michigan at age 71. 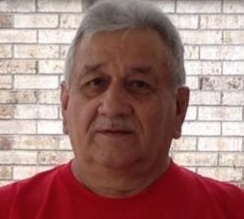 Juan was born on August 1, 1947 to the late Juan O. Sr. and Ester (Garza) Torres in San Antonio, Texas. After moving to the Bay City area, Juan married his high school sweetheart, Cristina, at St. Joseph’s Church in Bay City, Michigan on July 23, 1966. He was a member at Our Lady of Czestochowa Parish - St. Stanislaus Church. He attended Delta College and graduated with an Associate’s Degree in Business. Juan will always be remembered for his love of golfing, bowling, playing cards, watching Fox News, going to the casino, and playing the lottery. Nothing meant more to Juan than his family. He devoted his entire life to his wife, children, grandchildren, and many other family members. Juan would pause his life to take care of any family member or friend in need. Left to cherish his memories are his wife, Cristina Torres; four children, Lisa (Alfredo) Facundo, Theresa Torres, Michael (Amy) Torres, and Elena (Jeffrey Sr.) LaBeau; nine grandchildren: Leticia (Chuy), Tomas (Rebecca) and Marisol Facundo; Javier (Fiancée, Kate) Torres, Ellyssa, Jacen Torres, Zachary Torres, Joshua Vachon and Jeffrey LaBeau Jr.; three great-grandchildren, Ava Rose and Baby Facundo; and Kelsie Bryce; brother, Albert (Maria) Torres; sister-in-law, Nora Counterman; special nieces and nephews: Rocky, Johnny, Maria, Annette, and Lydia; and many other nieces, nephews, and cousins. After several years apart, Juan is welcomed into Heaven’s Gates by his parents, Juan O. Sr. and Ester (Garza) Torres; infant daughter, Irene Torres; four brothers, Raul, George, Robert, and Valentine Torres; and his half-sister, Socorro Hernandez.